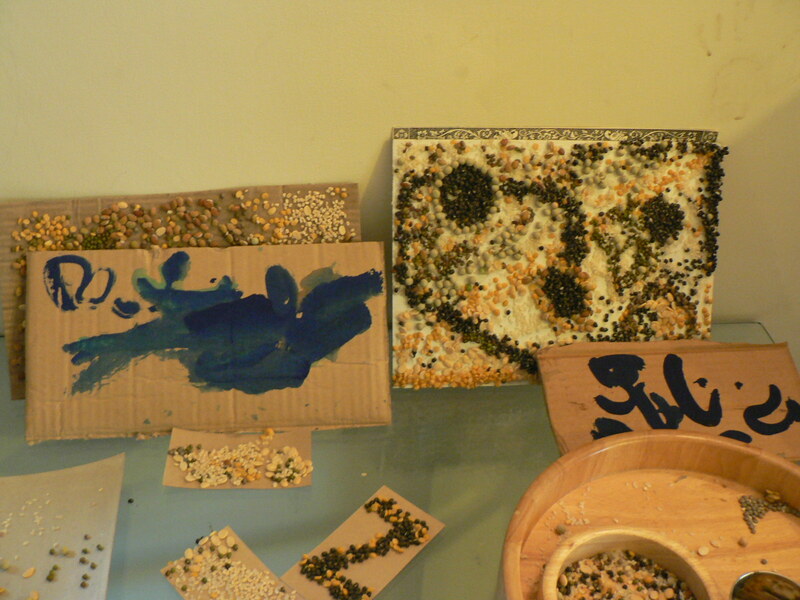 Some more pics of our day today… our grain art, colorful play home and the lovely collection of tools that made the grain art. Just by moving things around in the front room and deciding that while the kid may choose to watch TV and do the Wii… i could sit with them and do something that inspires me too…. the energy of the day changed! Raghu shared a lovely Wii moment with me… and then proceeded to do grain art. Zoya worked on the play house and listed to music from the 80s. Raghu came out and built an amazing Lego plane… but its not finished and so i can’t click it yet. 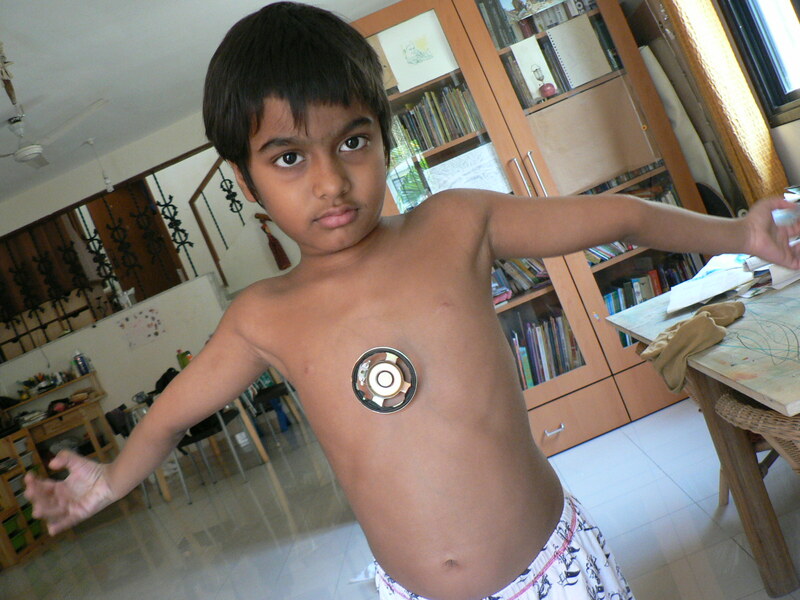 And now Raghu won a new level on his Spiderman Wii. One of the pics is of the big playdate we had at our home…. 6 kids and later one more. It was quite something. There were folks from Mumbai, Panchgani and Pune…. and a first homeschool get together for most of them. Then there is Zoya’s new house i our front room. 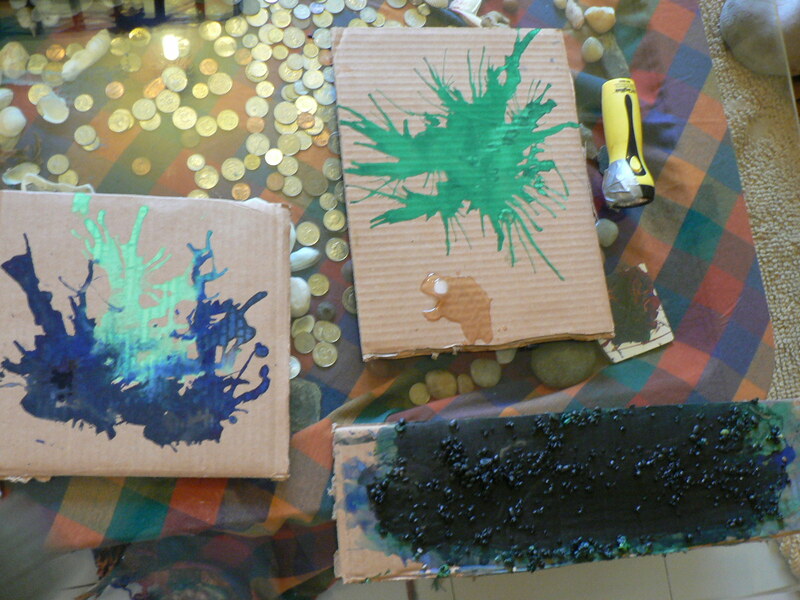 We painted it and made it out of the last pf the cardboard boxes from our move many months ago. 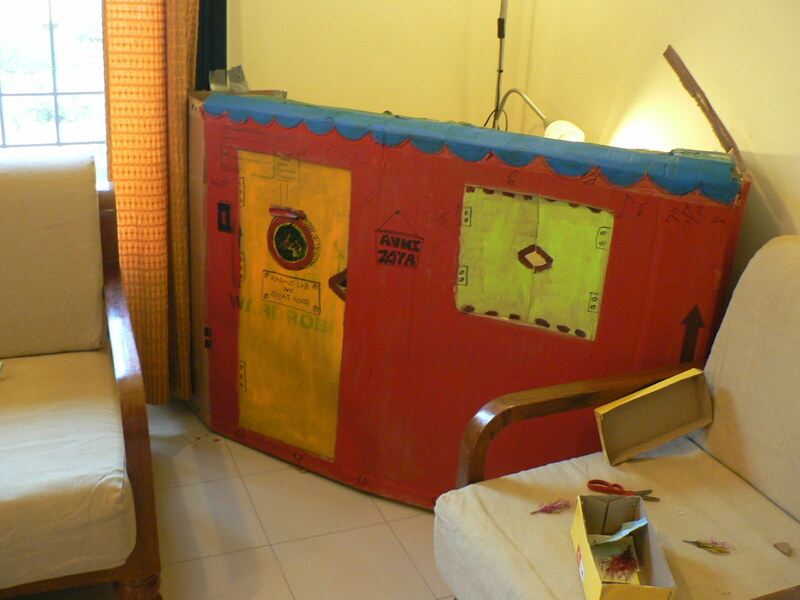 This one is supported by the side walls and makes good use of the corner of the room… there is a light inside and a couple of throws and some dolls and a snack. Zoya helped me all morning long. 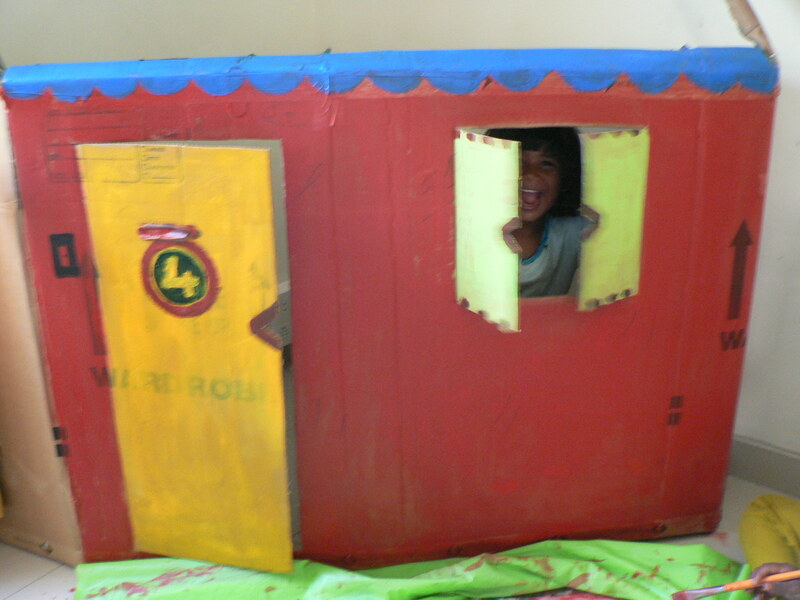 My helper, Roopa painted some of the red wall and was sweetly sitting inside the house for more than an hour playing house with Zoya. Today Raghu gave me an awesome experience. He was playing Spiderman 3 on the Wii. And he called out to me… so i ran in to the room. And he showed me Spiderman jumping from the Empire State building! He was so thrilled with the idea of climbing this tall structure that he remembers clearly from our days in NJ/NYC. And getting to jump from heights is very cool for him. he has no fear of heights… unlike me. Now you have to understand that my exposure to virtual environments in games with Raghu has been only in fantasy lands… like Prince of Persia or Mario etc. Not complete, realistic reality. But this game was allowing us to explore Manhattan, street by street! The street details were not so great… no stores or things. But still yellow cabs, people walking and generic store fronts etc were all there. Raghu and i were so excited to explore the city… i was able to tell him which way was north… and he got the idea and we found Central Park! And sitting here in Pune, India….. it felt surreal to be able to maneuver a swinging man thru a city i know well. Goosebumps as we explored a city i love and enjoyed walking in. I could tell Raghu about meeting Ravi for the first time at the then standing tall, World Trade Center Borders book store. And Raghu enjoyed seeing Manhattan from my perspective. He tends to explore gaming environs without paying attention to the time limit or challenge at hand. He enjoys exploring then he plays. No pressure to win. He focuses on clearing levels and winning when he wants to… otherwise not. Raghu and Zoya were dunking, making body mushroom shapes, floating happy and just completely being fish like in the pool today. I am so grateful for this peaceful little green prison we live in 😉 A lovely pool that is clean and a few steps away. We can run to it and not even take towels. just run back wet and dripping home. I found my facial muscles hurting from smiling continuously today in the pool. It was so blissful. My kids are fish and that made me inordinately happy. I could see their absolute pleasure in being able to glide thru water, twist in it, blow bubbles, hold their breath for long lengths, and really feel at ease inside the water. And the water is just cool enough for us to beat the heat. Here i sit with some jazz on and a full, happy feeling inside. My children are in the pool with Tanaya now. And i’m getting to write, update, finish calls for the next 1.5 hours. 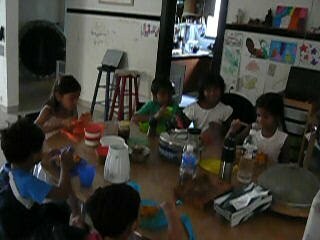 We are expecting 2 unschooling moms and kids to visit us next month. We also have a rapelling, trekking session happening for 3 days in Matheran next month. So a lot will be happening soon. meanwhile raghu has become a DJ on club Penguin… loves those games and earning online money and using it. Zoya is coloring and doing a lot more online these days. Ravi and i have decided to dedicate one evening a week to lego-mindstorm. We have recently managed our time to include 3 yoga sessions per week, with an instructor, from 6-7 am at home. And we both enjoy doing this class together so much that we felt we should try and do something with the kids that the 4 of us can work on together. So once a week we plan on putting on some groovy music, keeping dinner ready and just doing lego with the kids. Until now it was hard to do something where all 4 of us were involved… except swimming and rough play at home. But Zoya too has taken to lego these days… so the 4 of us can make this a regular activity. Mebbe its just time we made time for a week-night together thing. W’ends tend to be planned out/or catching up on sleep/doing impromptu things etc. So a weeknight where Ravi is making office-calendar space to be home at say, 7pm… means we can make it a ritual. Something the kids might take to. We’ll see. For now Raghu is very excited. So today ravi will be home by 7 and I’ll have lego, music and snacks ready for us. I posted most of the following to my PuneHomeschoolers group recently. Been meaning to share some news with you. For the past 2 years since we moved to India i had been struggling to find friends and classes for my children. Friends, who’s parents were relaxed and not on a school schedule. (Slowly this is working out thru our steadily growing punehomeschoolers group.) And teachers who are more like facilitators than rigid teachers. I have yet to find a class that Raghu loves here. Even the so called gymnastics class that we tried out at Orchid was idiotic. The instructor was making 4-7 year olds do 20 minutes of warm up, calisthenic type nonsense. I mean which young child needs a warm up? My kids and i kept waiting for the fun part… but there was none. Anyway… a while ago Divya connected me with Anandee (Prithvi’s daughter) who wanted to make some money via a flexible schedule. I offered to pay her by the hour if she could baby-sit my chidlren. By baby-sit i meant to hang out, play, follow my children all over the house kind of thing. She was awesome. Raghu especially loved talking to her about many things and would play lego with her. In a few months she had to return to her work/study elsewhere and could not continue. This first experience made me realize that it is possible to find alternate solutions to my problem. A few months later we moved into a different complex in Baner itself. And a neighbor here said that her 16 year old daughter was looking to tutor children over her summer vacations and in spare time. I requested her to drop the tutoring idea and just hang out with my 7 and 4 year old. Play lego, takes walks etc. Baby sitting in many ways. She agreed and the kids loved her from day one. Now the interesting part: This family had just returned from the US and it turned out that this young lady was a proficient swimmer who had come up to Life-guard level. Therefore she was confident about handling 2 children in the pool. So another lovely summer time activity… both my kids liked being in the pool with her. I can swim and care for one child without floats.. but 2 is hard… so i used to ask one of my chidlren to have a float on. Now they could both be without floats if they wanted. Within 5-6 sessions with her…. Raghu who was the more diffident one in the pool, started dunking his head in the water! And a week ago Raghu started to swim! No floats, nice long leg flapping, forward hands etc. Beautiful to watch how much he loved it. Now even more interesting… at some point, prior to the swimming sessions, while skating with Raghu on our terrace (Raghu held the rails) the young lady noticed that instead of telling him to do this and that and giving him pointers… it was better to just skate. Raghu had asked for the skating, he was obviously very keen on it. He simply watched her and learned. He is not skating yet.. but he progressed in his confidence that day. And the young lady learned about how he learns. And thats how the swimming sort of happened too. He watched her do simple strokes and he followed along. and she did not try and make it a ‘class’ or a carrot and stick thing or anything that conventional teaching does. She knew that i was not concerned with what Raghu achieved. So she was relaxed, friendly, having a great time with the kids and voila… my kids are enjoying and actually picked up a skill. Now wrt to video gaming. Reena’s daughter (this family is also a neighbour) likes video gaming in general… and Reena seeing Raghu’s video game interest asked me if i’d like her daughter to hang out with Raghu. So the young lady came and played on the Wii with Raghu. For 2 hours there was laughter, loud yells, and intermittent conversation emanating from the room. As i’m not intuitive in gaming… i tend to ask too many questions or i don’t play competently and tend to bore Raghu. Ravi is better at gaming but has little time. So this young lady was perfect. I miss the well-established, pervasive homeschooling/unschooling communities in the US besides the convenient urban parks, playgrounds and other amazing child-oriented options…. so i’m desperate for more solutions, unschooly options, open-ended, one-on-one facilitators like myself, groups that work around a child’s needs without condescension etc. As necessity is the mother of invention etc.. hooray for alternate paths.